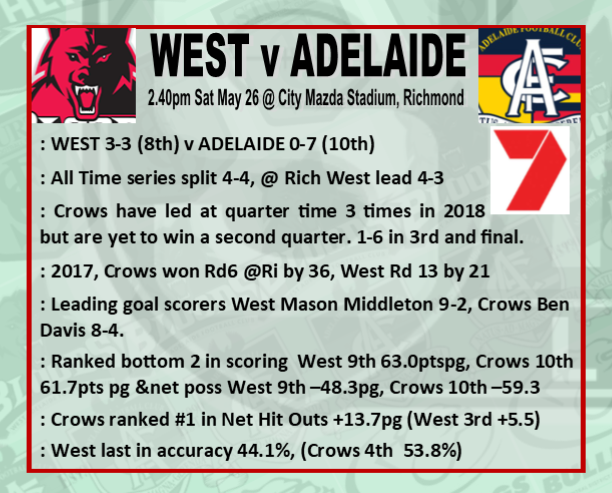 After consecutive 20+ goal wins, West's Reserves get a week off as the League side, fresh off their own win over Port, take on what's left of the Adelaide side. Who will win this week? West reserves play the State under 18's in a trial before the league game...it will be interesting to see if Izaak Rankin plays under 18's against his own side or is allowed to play league v the Crows. firstblood wrote: West reserves play the State under 18's in a trial before the league game...it will be interesting to see if Izaak Rankin plays under 18's against his own side or is allowed to play league v the Crows. Heard that the SANFL would punish West severely if they ignored the under 18's request for Rankine and played him in the league side. Heard the same thing firstblood. Corporate bullying. Why does the U18 team need a trial game anyway? In the history of interstate football at League level, state teams didn't play trials - they pick the squad, they train together and they play. And the U18 Championships are not about teams anyway. The AFL clubs don't draft teams, they're concerned with individuals. Most clubs do , it is only a bigger issue as they are playing West. I would think playing a league game is more beneficial anyway. Westies should win this one and keep the ravens on the bottom of the ladder. Bloods by 5 goals. UncleHuey wrote: Westies should win this one and keep the ravens on the bottom of the ladder. Bloods by 5 goals. Is the SANFL radio broadcast of West v Adelaide supposed to be available? It's not coming up as available. Flag No.10 wrote: Is the SANFL radio broadcast of West v Adelaide supposed to be available? It's not coming up as available. It's the channel 7 game so no radio. Thanks bt. Makes no sense mind. That makes 4 wins from the last 5 games. It's noticeable that one ot two 'supporters' only post when we lose and seem reluctant to post when we win.